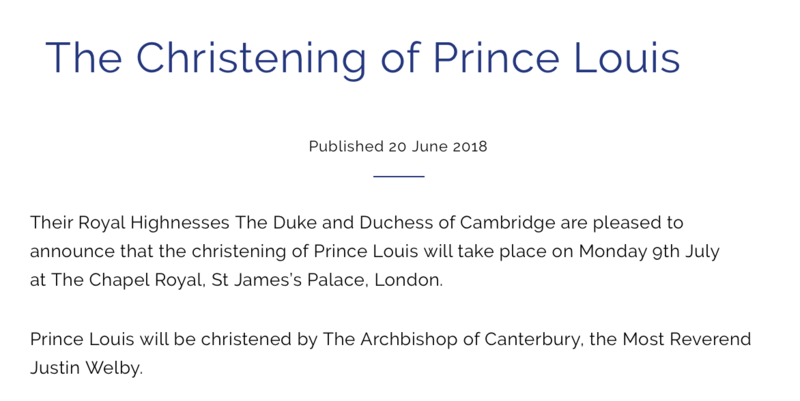 The royal family’s website posted the christening announcement yesterday, and the crowd went wild at the prospect of gathering further evidence that little Prince Louis does indeed exist! And of course he does, it’s just that he’s been wisely and safely tucked away up until now. The new little prince will be christened at St James’s Palace, the palace says. Their Royal Highnesses The Duke and Duchess of Cambridge are pleased to announce that the christening of Prince Louis will take place on Monday 9th July at The Chapel Royal, St James’s Palace, London. Prince George was also christened at St James’s Palace, while Princess Charlotte had her big day at Sandringham. “In keeping with royal tradition, Louis will be baptised when he is three months old. His older siblings Prince George and Princess Charlotte were three and two months old respectively,” Hello magazine reports. We haven’t sited Prince Louis since his debut on the steps of St Mary’s Hospital’s Lindo Wing, and royal watchers are very keen to catch a glimpse of the little guy. The newborn prince’s christening photos might just keep them at bay! It’s thought that the christening will be an intimate gathering, with the Cambridges, the Queen, Prince Charles, Duchess Camilla, Prince Harry, and Duchess Meghan on hand for the Royals. Kate’s mum and dad Carole and Michael Middleton, her brother James and her sister Pippa, who is expecting her first child, will be on the guest list too. Prince Louis’ godparents will most likely be announced on the day of the christening. Prince William and Prince Harry’s former nanny Tiggy Legge-Bourke is thought to be a likely candidate and Prince William’s former private secretary Miguel Head’s name is also being thrown around. The Church of England apparently suggests a minimum of three godparents, with Princess Charlotte having five godparents and Prince George boasting seven. The last 12 months have been incredibly flat-out for the Royals. It was the anniversary of Princess Diana’s death, Prince George started school, Prince Philip had surgery, the Queen turned 92, Princess Charlotte started nursery school, Prince Louis was born (on 23 April), the Queen had eye surgery, Meghan and Harry got married and the family appeared at the Trooping the Colour ceremony. Phew! It’s thought that Prince Louis will be christened in a gown that was created in 2008. The gown is a replica of one worn by 62 royal children – The Queen, Prince Charles, Prince William and Prince Harry amongst them. In fact, the gown was used so much that it had to be retired in 2004 and a new one was commissioned. The original gown was made in 1841 and was designed to resemble Queen Victoria’s wedding dress. The new replica of that gown was first worn in 2008 at the christening of James, Viscount Severn, the son of Prince Edward, Earl of Wessex, and Sophie, Countess of Wessex. Would you like to congratulate Prince Louis on his special day? You can write to him via his mum and dad (who appear to have their office at Clarence House).